Annan says economic recession has exposed a "crisis in global governance"
Rupert Murdoch: Western world has been living "way above our means"
HSBC boss Stephen Green admits banks "didn't cover themselves in glory"
DAVOS, Switzerland (CNN) -- The worldwide economic recession has exposed a "crisis of global governance" that can only be addressed by the radical reform of the United Nations, former U.N. Secretary-General Kofi Annan said Wednesday as the World Economic Forum got under way in Switzerland. "The current architecture of managing global affairs is broken and needs to be fixed," Annan said on the opening morning of the five-day annual meeting of global political and business leaders. "We have major new players coming on the scene and they need to be integrated and given a voice." Referring to the U.N. Security Council, which gives permanent places and vetoing powers to the U.S., the UK, Russia, China and France, Annan said: "We cannot continue to run the world based on countries that won a war 60 years ago. It's either destructive competition or cooperation. We live in an interdependent world and the only way to move forward is to cooperate." 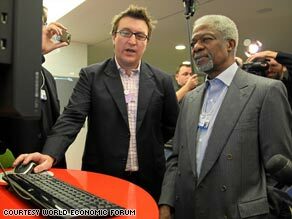 Annan is one of six co-chairs at this year's WEF gathering, along with news tycoon Rupert Murdoch, HSBC Chairman Stephen Green, Werner Wenning of the German chemical group Bayer, Indian industrialist Anand G. Mahindra and Maria Ramos, Chief Executive of the South African transport group Transnet. He also urged delegates to address three interconnected challenges: the global recession, energy and security, and climate change. "It is important leaders work on ways of finding effective, far-reaching policies -- even if they are radical -- that will allow us to create sustainable economic growth and create jobs for those who are out of jobs," Annan said. Newscorp. CEO Murdoch said delegates needed to be "absolutely honest about where the world is at this point," warning that the consequences of $50 trillion being wiped off personal fortunes had left people feeling "depressed and traumatized." "We've been living in the Western world way above our means. We've been on a great binge and it's come to an end and we have to live though the correction," Murdoch said. But he said the downturn offered a chance to set about tackling issues of energy sufficiency and pollution. "We must treat this crisis, whether it lasts for a year or five years, as an opportunity to set goals for how we want to come out of it. This is a time to shape the policies to help to solve some of those problems." HSBC boss Green said the banking industry needed to admit that it had not "covered itself in glory" in contributing to the collapse of the financial industry and called for continuing government intervention to "stop a nasty recession spiraling down into something else." But he said the major banks could contribute to solving the crisis as well: "I do not believe for a moment that you can have a successful economy without successful and properly functioning international capital markets." Wenning said he didn't expect any solutions to emerge from this year's meeting, but hoped delegates could achieve "a joint understanding of the reasons for the financial crisis" and called for a return to "the basics of sustainable behavior." "If we are really able to address these mega-challenges of the future then we would be able to restore the trust in leadership -- and I believe the world needs leadership." Political leaders will join the discussions later Wednesday with Chinese Premier Wen Jiabao and Russian Prime Minister Vladimir Putin both due to deliver agenda-setting addresses.